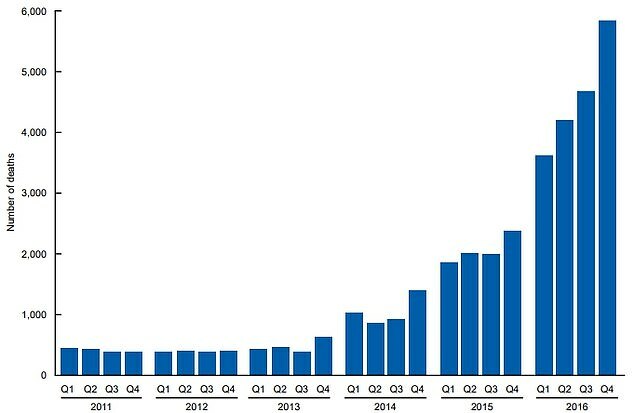 Deaths caused by the synthetic opioid fentanyl soared 11-fold between 2011 and 2016, new CDC data reveal. The rise started slow – climbing slightly from 1,600 deaths in 2011 to 1,900 in 2013 – before doubling every year. In 2016, 18,335 people were killed by the drug, which is up to 100 times stronger than heroin. 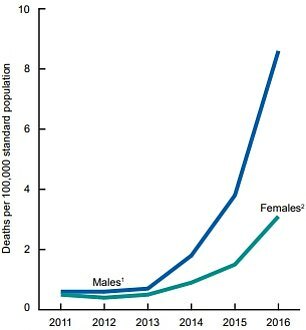 The new CDC report, published today, reveal men are hardest hit, dying at triple the rate of women. In recent years, rates have risen sharpest among Hispanic and black Americans, and particularly among young people aged 25 to 34. Fentanyl took hold of America in the grips of the opioid addiction epidemic. After decades of hyperactive opioid prescribing, US clinics had produced a generation of Americans hooked on highly addictive pills. While many got their fix from their doctors, those who could not get or afford more prescriptions turned to the street – to heroin and street-sold prescription pills. But increasingly, police and the Drug Enforcement Agency started detecting a new, powerful kind of drug claiming people’s lives. Fentanyl is a supremely powerful alternative to heroin; just a couple of milligrams could be lethal to an adult male. It was a handy alternative for drug traffickers who produce the stuff: heroin relies on the growth of poppies, and is subject to environmental hiccups. Fentanyl is made in the lab, quicker and cheaper. Drug tests and autopsies over the last few years revealed the drug was gradually being cut into everything – from cocaine to Percocet – as well as being sold straight for addicts who has built up tolerance to heroin’s effects. Fentanyl, addicts say, breaks through their barrier. For most, its strength is unfathomable, and overdoses are common. The new CDC data hammer that home, and show how swiftly the drug took hold of the US. 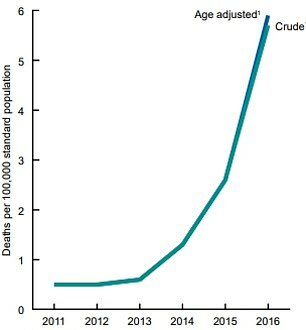 On a graph published in the report, the lines for deaths related to oxycodone, morphine, hydrocodone, and methadone all snake steadily at the same level, claiming between one and two deaths per 100,000 between 2011 and 2016. Heroin went from killing 1.5 per 100,000 in 2011 to 5 per 100,000 in 2016, in one straight, diagonal line up. Fentanyl took a unique trajectory. It went from claiming the fewest lives – 0.5 per 100,000 in 2011 – to easily claiming the most, swinging up in a J-shape to 6 deaths per 100,000.